What if the right friendship could change your life forever? An aging gunfighter is about to find out. Flint is an over-the-hill gunslinger in the old West: tough as nails and afraid of no one. He killed his first man before he could shave, has no family and few friends. He’ll never attack innocents nor shoot a man in the back; so, compared to many hired gunman, he’s actually a good person. However, after the past couple days, the gunslinger’s world and way of thinking has been turned upside. It all started when a wily mountain man, who throws a quick blade and is a crack shot with a rifle, invited the old gunfighter to ride with him. The rumor mill claims that if you tangle with “the Boy”, you’ll earn yourself permanent residence in boot hill. Surprisingly, the Boy offers Flint a partnership and something he secretly craved for since he was a small boy. 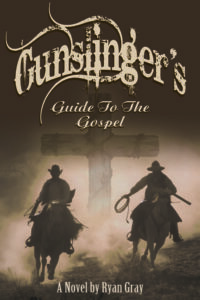 The Gunslinger’s Guide to the Gospel is a story of an unlikely partnership between two tough frontiersman. One willing to leave an old life behind to chase after the unknown in search of peace and forgiveness—the other, to share his secret of peace and forgiveness with anyone he meets. I wanted to write a faith-based book about discipleship. A story about taking someone under your wing and acting as a mentor, teaching them a new way of living life. However, instead of another self-help, non-fiction book, I had an idea for something a little more fun and challenging. What if I could write about discipleship, through my favorite of all genres, a Classic Western. As a story, this book has it all: love, action, adventure, intrigue and a plot twist. Most importantly, the story’s purpose is to inspire an ideal relationship between teacher and pupil; which I hope challenges the readers to ask themselves, “Who in my life needs a friend, and how can I take them under my wing as a big brother or big sister?